A recent survey of your 500 of your marketing peers revealed something startling: less than 1 in 6 felt they were fully-integrating Modern Marketing concepts. How do you compare? (If outbound campaigns are the first things on your tool list, you may end up last in the competitive race.) This special report from the experts at BtoB Research Services explores where online marketing technology is going and, more importantly, how far along your peers feel they are in adoption and ROI. 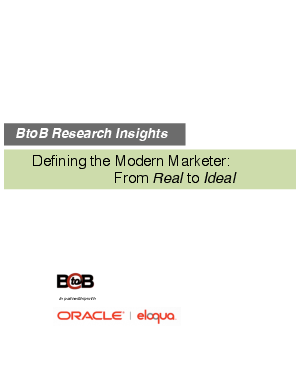 Read “ Defining the Modern Marketer: From Real to Ideal” to read the findings and conclusions.